November 30, 2016 Robert W.
Westgate Las Vegas Resort Convention signs are everywhere at the Westgate Convention Center at 3000 Paradise Road, Las Vegas Nevada 89109. The Westgate is a very popular place to hold conventions in Las Vegas and is located near the Las Vegas Convention Center. With its thousands of square feet of space dedication to conventions and meetings, it offers a first class venue to hold conventions along with its hotel and casino. Located in the heart of Las Vegas, it is easy traveling to many other facilities and casinos. Westgate Las Vegas Resort Convention signs include banner stands ( retractable or pop up), vinyl signs, banners, foam core signs, coroplast signs and many other types of signage for your convention needs. Retractable banner stands are one of the most popular display graphics at conventions. These banner stands are easy to set up and very portable.it only takes a minute or two to set up and come in a variety of sizes. Banners are another easy display graphic that can be set up in short order. many people who are exhibiting at Westgate use banners as a backdrop to their booths so that they can be seen behind them as a visual reinforcement . These banners can be full color and also include logos and pictures printed on them as well. They can be used over and over again with simple maintenance. These banners cost around $2.00 a square foot and can be made the same day. Foam core signs are printed signs on 3/16 or 1/2 foam core board that give a very professional appearance. They are used indoors and put on easels at meeting and conventions. Westgate Las Vegas Resort Convention Signs can be purchased at any of the sign shops in Las Vegas at very reasonable prices. They can be produced very quickly to either replace lost or damaged signage or at the last minute to reflect changing marketing strategies. Mandalay Bay Event Center Signs For Your Trade Show. November 29, 2016 Robert W.
Mandalay Bay Event Center signs are always needed for trade shows and conventions. Every booth has some sort of signage in it to help customers visualize what you are offering in terms of goods and services. You cannot walk through the Mandalay Bay Event Center,3950 Las Vegas Blvd. South Las Vegas, Nevada 89119 without seeing many signs and banners. Many times people attending the Mandalay Bay Center forget their signs back home or need their signs and banners replaced in a hurry because they are lost or damaged. I have even heard of display graphics being stolen in order to give a competitor an advantage. Fortunately, Las Vegas has many sign facilities that can offer last minute display graphics or same day signs to replace the lost or damaged graphics. There are many sign shops located in Las Vegas because Las Vegas is the number one place to hold conventions and trade shows in the world. There are more trade shows, exhibits and conventions held in Las Vegas than any other place. There is so much to do in Las Vegas and so much fun to be had, that everybody wants to come to Las Vegas for their shows and have fun. There are many types of signs that are at the Mandalay Bay Event Center. There are vinyl banners in a variety of sizes, retractable or pop up banner stands, foam core signs, sidewalk signs, vinyl signs and many other types of signage at great prices and can be made in a short time. Las Vegas has many professional sign shops to assist in making your convention or trade show a success. Mandalay Bay Event Center Signs can be found in Las Vegas at one of the many sign and banner shops. Simply do a online search for signs and banners near Mandalay Bay. November 28, 2016 Robert W.
Las Vegas sign and banner shops are a great choice for signage in Las Vegas. While many online sign shops exist and offer too good to be true signs and banners, Las Vegas sign shops offer tremendous advantage over online sign shops. There are many horror stories I come across from people who come in to my sign shop about how they ordered a sign or banner online and how disappointed they were with the signage. The most common complaint is lack of quality. I have seen some of these banners and signs and they barely have enough ink on the substrate , causing the colors to be very light and not full of “life”. The problem is that returning the sign or banner is such an inconvenience for the purchaser, they rarely return it and just learn their lesson and order a sign and banner locally. Las Vegas sign and banner shops use eco solvent or latex inks that are designed to bring your signage to “life”. These inks produce bright and vivid coloring and will last a long time, even in the outdoor weather of Las Vegas where it gets well over 100 degrees for several days straight. Las Vegas sign and banner shops are very competitive in their pricing. When adding up the cost of shipping and all the extras that these online print companies charge, Las Vegas signs and banner shops offer a better value. Not only do you get the signage quicker, but you get a more quality product that can quickly be remedied if the signage needs to be reprinted or changed. Las Vegas sign and banner shops can be found online by simply searching terms like ” signs and banners near me” or “sign shops near me”. Take advantage of these quality sign shops in Las Vegas and remember to shop locally. November 27, 2016 Robert W.
Palace Station meeting rooms signs and banner are available in the Las Vegas area. Las Vegas is host to many exhibitions and meeting room conventions and require necessary visual reinforcements for their mini conventions and trade shows. Palace Station’s meeting room and event space is located at 2411 w. Sahara, Las Vegas Nevada 89102. They host many smaller type convention and trade show venues that do not require a lot of space. However, many of the people exhibiting at Palace Station require signs and banners as part of their demonstration. Palace Station meeting rooms signs and banners include banner stands, vinyl banners, vinyl signs and foam core board signs. The banner stands, one of the most popular graphics at convention venues, cost less than $100 and only take a few minutes to set up and take down. They are very compact and require little display space ( which is why many business people like them),. These banner stands are very portable and come with a convenient carrying case to make them very easy to travel with. Foam core board signs are also very popular at smaller venues also. These foam core board signs are a vinyl print mounted on a foam core board and usually have a laminate on top of them to make them very professional looking. These signs are then placed on easels as visual reinforcements for what the speaker is talking about. Banners are just a cheap graphic that is very cost effective in getting your message across. Large format printers print directly onto the banner material and can be full color, meaning you can have as many colors on the banner as you like, along with pictures and logos. Palace Station Meeting Room Signs and Banners can be found in Las Vegas at various sign shops in the area at very reasonable and cheap pricing. November 26, 2016 Robert W.
Mandalay Bay signs and banners help make their conventions and events a huge success. Mandalay Bay Convention Center, 3959 S. Las Vegas Blvd, Las Vegas Nevada 89109, is one of the most popular venues to hold conventions, exhibits and trade shows. With over 2.1 million gross feet of meeting and convention space, it is one of the largest convention centers in the world. Mandalay Bay is constantly upgrading their facilities to make sure your trade show and convention has the best venue available. Backdrop banners, also known as step and repeat banners are a huge hit at the shows as well. This is where a company will print their name or logo ( or sometimes both) on a large banner and stagger it so that it can always be seen from whatever angle you are looking at it. This helps in making people remember your company name and sets you apart at the conventions. Mandalay Bay signs and banners can be found at local sign shops in the Las Vegas area. Summerlin Nevada 90117 sign shops are a great source of signage if you need signs and banners. These Las Vegas Summerlin sign shops can make you a variety of signs and banners at reasonable prices and quickly. Businesses in the Summerlin area need many different types of signs to reach out to their customers. Businesses in Summerlin are learning that large vinyl banners ( can be purchased at www.LasVegasLargeBanners.com) can be used on their premises to advertise their goods and services. For example, a local cleaners can advertise they are having a special on cleaning ”bed comforters” and let the neighborhood know this by placing this advertising on a banner and then hanging the banner from their building. They are taking advantage of the vehicle traffic that passes there store everyday. These people driving by, ( and there are thousands of vehicles every single day that drive streets like Sahara, Ft. Apache, etc.) will take notice of their advertising banner and hopefully use their services. One cleaners in Summerlin rotates their advertising banners every two weeks so that their cleaning specials do not go stale. The people in the neighborhood look forward to the specials on shirts, dresses, ties, blouses, etc. because Summerlin has such a professional crowd that needs their clothes cleaned and pressed by professionals. Summerlin Nevada 89117 sign shops are also for charity organizations, sports teams and many other types of non businesses. Many Little League and soccer teams utilize small banners to represent their teams at the local sports parks because their are no scoreboards to help identify the teams. Charity organizations use vinyl banners to let people know about their events. Summerlin Nevada 89117 sign shops can be found by using a internet search or the yellow pages. Take advantage of sign shops and see how they can help you. Cashman Center Signs and Banners. November 25, 2016 Robert W.
Cashman Center signs and banners can be made locally by Las Veags sign shops. Many signs and banners are needed for the various events that are held at Cashman center at 850 N Las Vegas Blvd Las Vegas, NV 89101. Cashman Center has available trade show and convention space of over 90,000 square feet. Cashman Center Signs and Banners also include traditional vinyl banners, foam core signs and other types of signage. Foam core signs are made with 3/16 foam core boards and usually come with lamination and have a very professional look. They are designed for indoor use only as the outdoor weather would warp them. They are mainly placed on easels. Vinyl banners are a favorite at Cashman Center as well. These vinyl banners sell for around $2.00 a square foot and are a very cost effective way to advertise what you are selling. These vinyl banners are traditionally printed on a 13 ounce vinyl banner material and can be used for both indoor and outdoor uses. When stored properly, these vinyl banners can last a very long time and be used over and over. Cashman Center signs and banners can be purchased online through sites like www.LasVegasLargeBanners.com or at local sign and banner shops in the Las Vegas area at very good price points. November 24, 2016 Robert W.
Signs located near me is a great way of finding a sign shop close to your location that can assist you with your sign and banner needs. Simply use your cell telephone with that search term ” Signs located Near Me” and you will find a Las Vegas sign shop willing and able to assist you. Signs located near me is great for people exhibiting at the conventions and trade shows. More often than not, people at the Las Vegas Convention Center or the Sands Expo will find themselves in Las Vegas without their display graphics. Either the airlines will lose their graphics or they become damaged upon arrival, these graphics need to be replaced in a hurry. Fortunately, Las Vegas has many sign shops that can replace your graphics in a hurry. These sign shops ( who service the convention and trade show industry) have top of the line printing equipment that can replace your signs and banners in a hurry. If the sign shop has the ability, no same day or next day fees will be charged if they have the ability to make your signs and banners. Las Vegas businesses can use the search term ” Signs located near me” as well to locate a local sign company for their graphics. After all, why go all across town when a local sign shop can help you in getting your graphics in a timely manner . Local sign companies have the abilities to make banner stands, vinyl banners, foam core board signs, coroplast signs as well as many other types of signage. Simply call a few of the local sign shops to get their product pricing, look at their reviews on Yelp and Google, and that will help determine what sign shop is best for you. Finding a local sign shop is easier than you think. November 23, 2016 Robert W.
Las Vegas 1 day banners can get you that needed vinyl banner in a hurry. For many reasons, sometimes same day banners are necessary and Las Vegas has an abundance of sign shops willing to assist you in getting that banner done in a hurry. Whether the banner is for a special event , business or a trade show, Las Vegas has many sign shops willing to make that banner in 1 day. You would be surprised at how many times people come to the Las Vegas trade shows to exhibit and for one reason or another, find themselves without their signs and banners. Many times the graphics are damaged while being transported, a fellow business sabotages them or simply the shipping company that was entrusted to deliver your graphics makes a mistake. These banners and signs need to be replaced in a hurry so that the show can go on. Las Vegas 1 day banners are also used for special events in Las Vegas. Las Vegas is the host to many different types of events such as the Walk for Cancer, Gay Pride, Martin Luther King, Veterans Day Parade, and many other types of parades. These banners also need to be completed in a hurry. Sign shops need large format printers to assist them in making Las Vegas 1 day banners. These large format printers can print at very fast speeds and print with great clarity and color. By utilizing state of the art printers, sign makers are able to lower the cost of Las Vegas 1 day banners and make them a very affordable medium of advertising for businesses. When compared to mail coupons, print advertisement in newspapers, radio and television, vinyl banners are a excellent return on investment for advertising to the public. 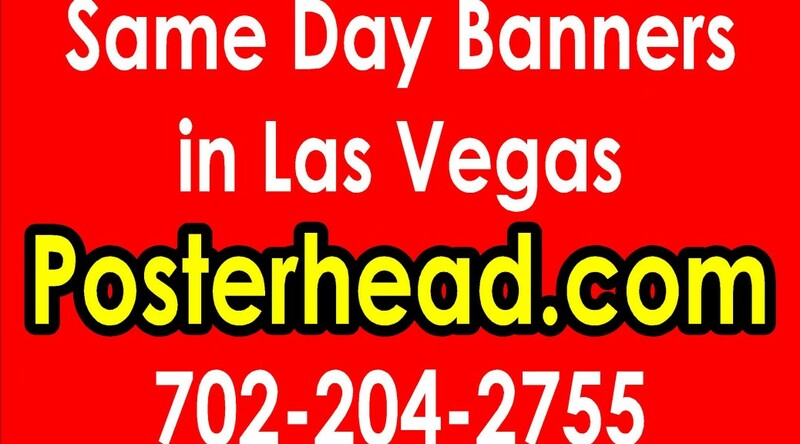 See how Las Vegas 1 day banners can work for you. November 22, 2016 Robert W.
Banners and Signs near me is a good way to search for a sign and banner shop through a internet search. If you use your cell telephone, mobile device or home computer to search for a sign and banner shop, the search term would ne ” Banner and Sign Shops Near Me” will bring results to local sign shops. This search term is especially important for people coming into Las Vegas for the trade shows and exhibits. Many times these people who are displaying their goods and services at these events need last minute signs and banners for a variety of reasons. Display graphics are constantly getting lost or damaged and need replacing at the last minute. After all, it makes no sense to travel all the way to Las Vegas to impress people in your industry without the necessary visual graphics to back up your marketing message. Also, many businesses change their marketing material and graphics at the last minute in order to reflect ever changing market conditions. Banners and Sign shops near me can make a variety of different types of signage. Signs are a great way to get your business or event noticed. Large banners are very easy to see when hanging on buildings or fences. During political season, want to be politicians use coroplast signs to attach to fences and place them on lawns in order to get their name and political message across. Foam core board signs are used at business presentation meetings daily across the Las Vegas valley. These signs and banners are very cheap as compared to other types of advertising mediums like radio advertising, print advertising, or those mail coupons we all receive in the mail and throw away.